Linoleum, more commonly known by the shortened name, lino, was originally developed as a floor covering. 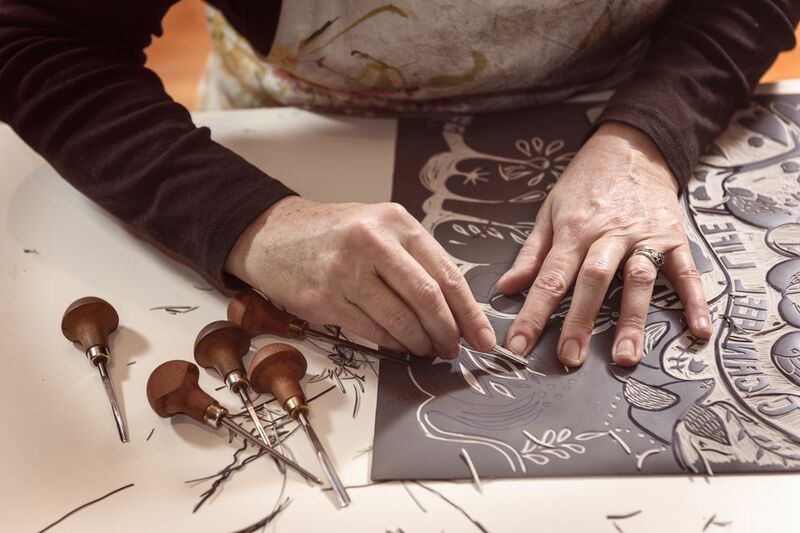 It is now popular with artists who carve into the smooth lino surface, creating linocut blocks that are used for block printing. These carved lino pieces can be used for a variety of purposes, including creating art prints and printing images on t-shirts. Small linocut images also make great stamps. Small pieces of lino can be carved to make custom stamps. While lino is a little harder to work with than other carving blocks, it is relatively low cost and readily available. Lino must be carved with special carving tools. A range of different cutting knives will allow fine lines to be carved in the lino as well as for removing large portions of the surface. Lino is much harder to carve than rubber or soft carving blocks. It is best to take a slow approach when carving lino. Working fast may result in the cutting tools slipping. This may add unplanned detail to design or result in cuts to your hands. There are soft versions of lino available from arts and craft stores. Standard lino can also be warmed up before carving, and this will aid the carving process. Images are easy to transfer onto lino. In addition to drawing an image onto the surface of the lino freehand, it is also possible to trace and transfer an image on the lino. While many print artists use printing ink or paints to make lino prints, it is possible to use normal rubber stamping inks. Stamping inks work particularly well with smaller sized carvings. There are many ways of using a hand carved lino stamp. It can be mounted onto an acrylic block and stamped in the normal way, or the lino can be placed onto a flat, solid surface and the paper placed on top of the stamp. Use a brayer or your hand to rub over the paper to make sure that the ink is evenly transferred. Lino is generally sold in sheets of varying sizes. Small sheets are ideal for smaller projects or someone just trying lino carving. Larger sheets are better for bigger projects or for someone who intends to make many carvings. Lino is typically gray or rust red. The color does not affect the finished carving. Lino suitable for carving is readily available from arts and crafts stores. Lino is generally much cheaper than soft block such as SpeedyCarve from Speedyball Art Products. Some lino blocks come mounted onto wood. While this is ideal for big projects, for the majority of small rubber stamp sized projects unmounted lino will be fine. Unmounted lino has many benefits—it is often double-sided, it is cheaper to buy and, being lighter and less bulky than mounted alternatives, it is cheaper to deliver.